Making homemade granola and teaching a class on making this beautiful granola into little treat bags for the upcoming holiday season makes this time of year even sweeter. 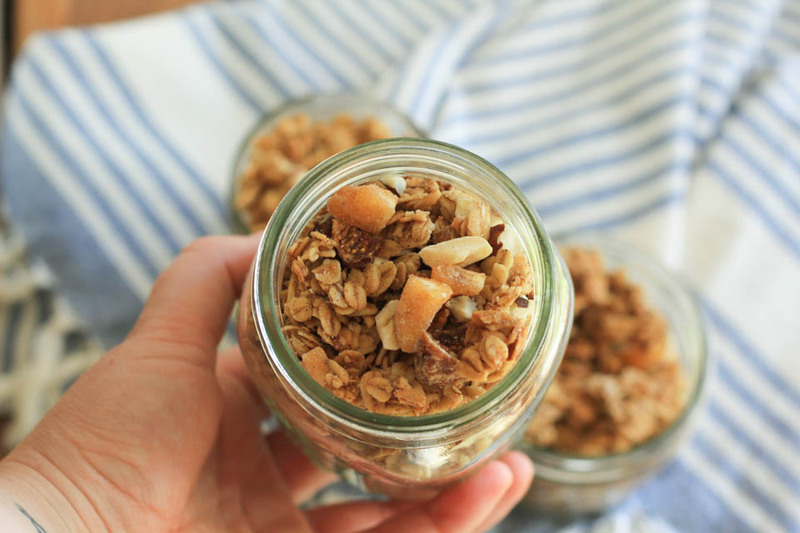 The super cool thing about this granola is every ingredient in this recipe is from the PNW! So I called it Homemade Oregon Granola for the class I’m taught, but it can be made anywhere you are with ingredients from your area too. You can book my class too, I can come on over or come to Cookshop in Portland for a private event and have your friends over so we can make homemade gifts for you to give to all of your friends! This is the perfect Fall granola recipe that can be a healthy snack and filling breakfast with milk or yogurt. It is also a lovely and super thoughtful homemade gift for the holidays. I fill little baggies or mason jars with a jute tie and tag for personalizing. Make it even more festive and take a walk around your neighborhood or backyard for pinecones, pretty leaves, or fallen small pine branches. You can even add whole cinnamon sticks tied to the tag, it’s super cute! *First Toasting hazelnuts: Place oven rack in center of oven and preheat oven to 275 degrees. Place hazelnuts on a baking sheet, place in oven, and bake for about 10 minutes or until lightly golden brown. Keep an eye on them at 10 minutes, they can over roast quickly. Remove hazelnuts from oven, place in a large clean kitchen towel, allow to rest for 5 minutes. Then rub hazelnuts vigorously in towel, removing the outer skin as much as possible. It’s ok if there are some that keep a little skin, there are nutrients in the skin. Place the oven rack in the middle and preheat oven to 350 degrees. Line baking sheet with parchment paper. In a large bowl add oats, cinnamon, and salt, stir to combine well using a spatula. In a medium bowl combine olive oil and honey/maple syrup, whisk to combine using a fork. Add the liquid to the oats mixture, using a spatula, mix well. Place oat mixture on a parchment lined baking sheet. Spread evenly, pressing down firmly to compact the mixture. This creates larger chunks after baking. Place in oven and bake for 25-30 minutes, or until golden brown. 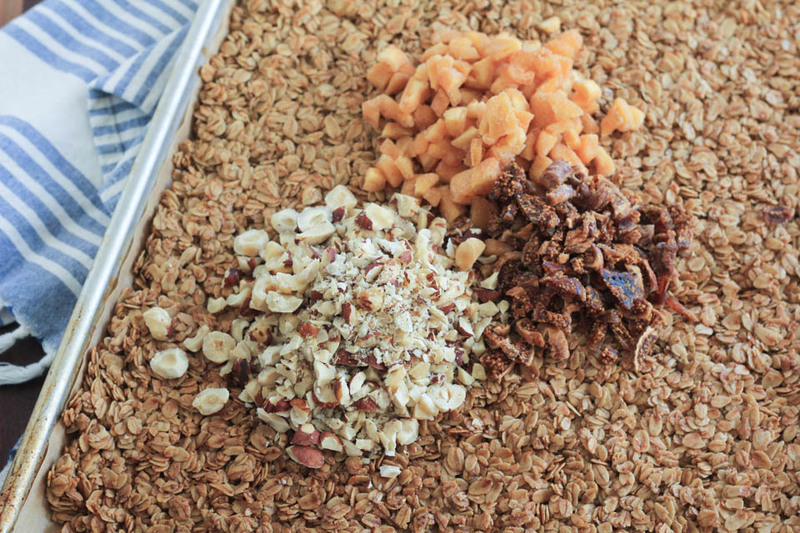 While the granola is baking add the toasted chopped hazelnuts and dried fruit to a large bowl, mix to combine. Remove baked granola from the oven, allow to cool for 20 minutes. Once cooled, place the granola in the large bowl with the nut fruit mixture. Break apart the granola into medium chunks, easy for snacking. Disclosure: This is a compensated post in collaboration with the Ashland Chamber of Commerce. As usual all opinions are my own. Thank you for supporting the companies that support NJB! Yum! I love your choice of ingredients in this granola! Of course my favorite nut is a hazelnut, and I adore dried figs! Thanks! Homemade granola is the absolute best!! This looks so scrumptious; love that you’ve used fig, I’ve never seen it in granola before! Homemade granola is the best! I love the flavor combinations you created. Thank you! 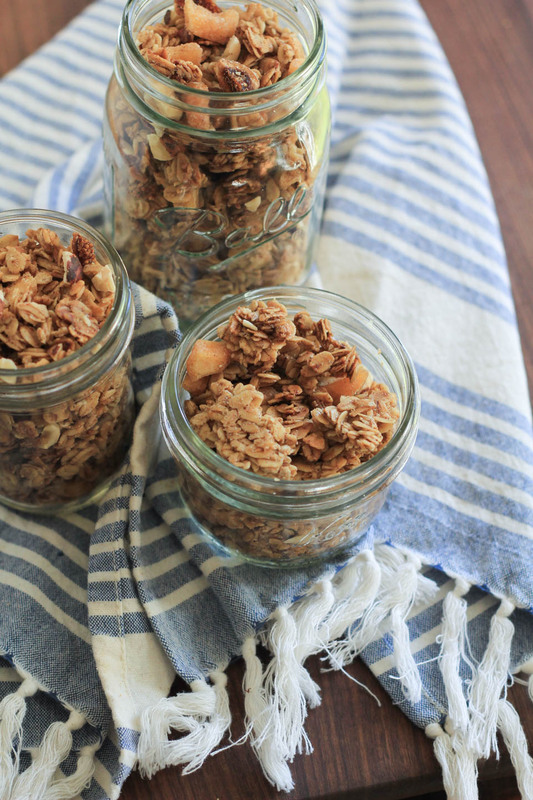 I love making granola all year long :). Oh my gosh, it would! Great idea. Just attended your Granola class at the Ashland Culinary Festival and it was fabulous! Hi Susan! Thank you so much, this message warms my heart and made my day. I appreciate your kind words so much. I love teaching classes, and the feedback is the best! I hope to see you at next years event again! Keep in touch and let me know if you ever have any questions about recipes :). This looks really good. I love all the fun ingredients you added (other than oats ;)). I’d throw in some dark chocolate chunks too! Good call! I love a little chocolate in granola too :). Sometimes I add cacao nibs. Thank you dear!